East Longmeadow is part of the Springfield Metropolitan Statistical Area, directly south of Springfield itself. East Longmeadow hosts an annual Fourth of July Parade. It is the largest Fourth of July parade in western Massachusetts. East Longmeadow High School also serves as host to an annual Fourth of July fireworks display, traditionally held on July 3. East Longmeadow was first settled in 1720 and was officially incorporated in 1894. It was famous for the Redstone industry, a stone used for building several places, like Boston's most famous church. The railroad closed with the industry and the old depot used for storage. East Longmeadow and Longmeadow compete in an annual Thanksgiving Day football game that routinely attracts a few thousand spectators. The town is also the home to the 2007 Western Massachusetts champions in  Varsity High School Baseball, along with the Western Mass champions in Girls Indoor Track in 2010, and 2011. According to the United States Census Bureau, the town has a total area of 13.0 square miles (34 km2), of which 13.0 square miles (34 km2) is land and 0.04 square miles (0.10 km2) (0.31%) is water. East Longmeadow is bordered by Enfield and Somers, Connecticut to the south; Hampden to the east; Wilbraham on the northeast; Springfield on the north and northwest; and Longmeadow on the west. As of the census of 2010, there were 16,187 people, 5,248 households, and 3,988 families residing in the town. The population density was 1,087.1 people per square mile (419.7/km²). There were 5,363 housing units at an average density of 413.5 per square mile (159.7/km²). The racial makeup of the town was 97.52% White, 0.74% African American, 0.04% Native American, 0.88% Asian, 0.05% Pacific Islander, 0.24% from other races, and 0.52% from two or more races. Hispanic or Latino of any race were 0.92% of the population. There were 5,248 households out of which 34.1% had children under the age of 18 living with them, 65.7% were married couples living together, 7.5% had a female householder with no husband present, and 24.0% were non-families. 21.6% of all households were made up of individuals and 13.8% had someone living alone who was 65 years of age or older. The average household size was 2.65 and the average family size was 3.10. In the town, the population was spread out with 24.8% under the age of 18, 5.5% from 18 to 24, 26.4% from 25 to 44, 24.6% from 45 to 64, and 18.8% who were 65 years of age or older. The median age was 41 years. For every 100 females there were 90.7 males. For every 100 females age 18 and over, there were 86.2 males. The median income for a household in the town was $62,680, and the median income for a family was $70,571. Males had a median income of $51,062 versus $32,267 for females. The per capita income for the town was $27,659. About 2.1% of families and 3.4% of the population were below the poverty line, including 4.7% of those under age 18 and 5.9% of those age 65 or over. A point of interest in East Longmeadow is Heritage Park. Heritage Park has a body of water known as "Walt Seifert Pond", swans and fish, as well as baseball fields, soccer field, play scape, and a picnicking area. Historic places in East Longmeadow include the numerous red and brown sandstone quarries that gave the town its industrial beginnings and from which the original Smithsonian Institution building in Washington was mined, and the Elijah Burt House, The Seward Pease House and the First Congregational Church. Another point of interest is the area around the central rotary. Here, there are small shops, including many restaurants such as Koffee Tyme, DeNardo's, Fazio's, Romito & Sons, the Pizza Shoppe, Center Square Grill, Bentley's, and recently The Beer Shop. Also an integral part of East Longmeadow are the many churches, such as St. Michael's (Catholic), St. Paul's (Lutheran), St. Mark's (Episcopal), First Congregational (UCC), First Baptist, Cornerstone Church, East Longmeadow United Methodist, St. Luke's (Greek Orthodox) and many more. Also, East Longmeadow was home to Milton Bradley Company for many years, and still houses one of their largest facilities after Hasbro bought this corporation in 1984. In 2016 the Hasbro location was purchased by Cartimundi. 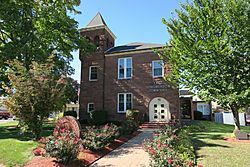 The East Longmeadow public library began in 1896, but in 2004 a new library was put in and is now very popular. In fiscal year 2008, the town of East Longmeadow spent 1.4% ($584,361) of its budget on its public library—some $38 per person. East Longmeadow, Massachusetts Facts for Kids. Kiddle Encyclopedia.